Rooftop lawns and gardens have a long history, dating back many centuries. They are still around to this day and can greatly help to improve a building’s aesthetic, environmental impact and can also act as an oasis in a concrete heavy city. Some people even go the whole hog and create an entire rooftop garden, with flowers, herbs, larger plants and different types of grass. This makes quite a bit of sense as a rooftop is the ideal place for sunlight and rain. This also means that you need to choose your vegetation wisely – if your plants aren’t sun-loving they might just perish in these conditions. Let’s look at the benefits of a roof lawn, and how you can go about creating one. There are many benefits to growing a roof lawn. The first is of course aesthetic. It looks amazing and will be a real drawcard – especially for commercial and hospitality businesses. Rooftop bars and restaurants with real turf should get glowing reviews and word of mouth advertising will spread like wildfire too. 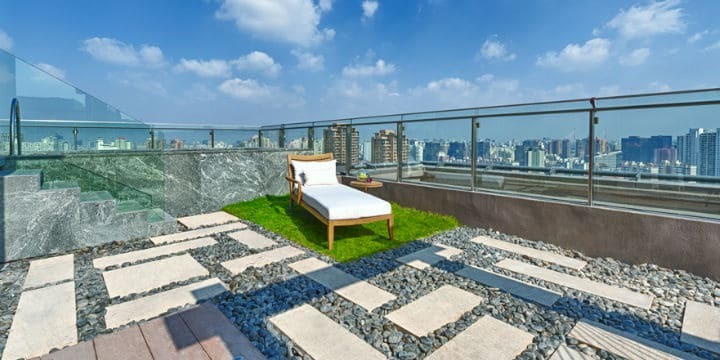 If you are in a position to grow a rooftop lawn on your property imagine entertaining your guests in summer, with some drinks and the kids playing barefoot in the grass on your roof! Priceless. The second is that the more grass we all grow the better the environment is. This is due to the photosynthesis that occurs in most green plants – it helps to stabilise the Earth’s atmospheric oxygen levels. Let’s look at how to go about turning your roof into a lush, relaxing space by adding some turf. The first thing you’ll need to do is determine if your roof can safely host a lawn. Only a structural engineer can figure this out, so please hire one before going ahead. The weight of a wet lawn on your roof may not be safe for every building. Also, only flat roofs are suitable for a rooftop lawn. If your roof is angled or thatched then you may have to replace it with a flat one prior to undertaking this project. Once you know that you can safely go ahead, you’ll need a waterproof barrier between your roof and your lawn. This needs to be quite thick and protect against root intrusion too. Tar can work for this, as can rubber membranes. If you’ve followed all of these steps, the next thing to do is get growing! You can lay topsoil and seed yourself, or you can buy pre-grown turf and have it laid so your rooftop oasis can flourish that much quicker. Hi Quality Turf can help you with all of your projects. To get an instant quote or buy online, visit our website now or call 1800 040 981. See our full contact details here.